Pinterest is all ready for its public trading debut this week. In its initial public offering (IPO), the company aims to sell 75,000,000 shares at a price of $15 to $17 and will most probably be valued between $10 to $11.3 Billion. To make the deal a bit more attractive, the executives decided to reveal Pinterest’s goals and objectives to the general public, along with how it is faring against the other social media giants. Much to one’s surprise, Pinterest doesn’t really consider itself a social networking platform. In fact, the company has clearly stated in its S1 filing, that the platform is all about content discovery. 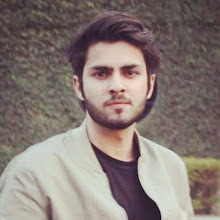 While many internet companies are either digital tools/services (search, eCommerce) or media channels (newsfeeds, video, social networks), Pinterest has always focused on becoming a media-rich utility, that will always satisfy the emotional and functional needs of its users. 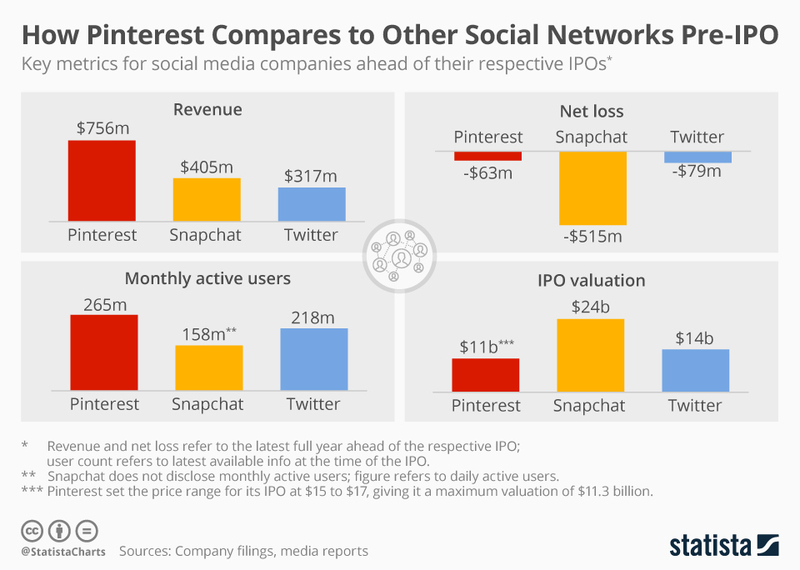 In an interesting comparison, Pinterest is better than many other social media platforms at the time of its IPO. Although its valuation is half less than Snap’s $24 Billion IPO, yet its profitability is better and has more number of users. Pinterest generated a revenue of $756 million last year and had to bear a net loss of $63 million ( a significant drop from $130 million in 2017) with 256 million monthly active users (MAUs) at the end of 2018. Whereas, Snap earned a revenue of $405 million and the net loss was $515 million with 158 million active users at the time of their valuation. Moreover, Pinterest stands in competition with Twitter as well considering the fact that Twitter had 218 million monthly active users before the IPO and was valued at $14 Billion. 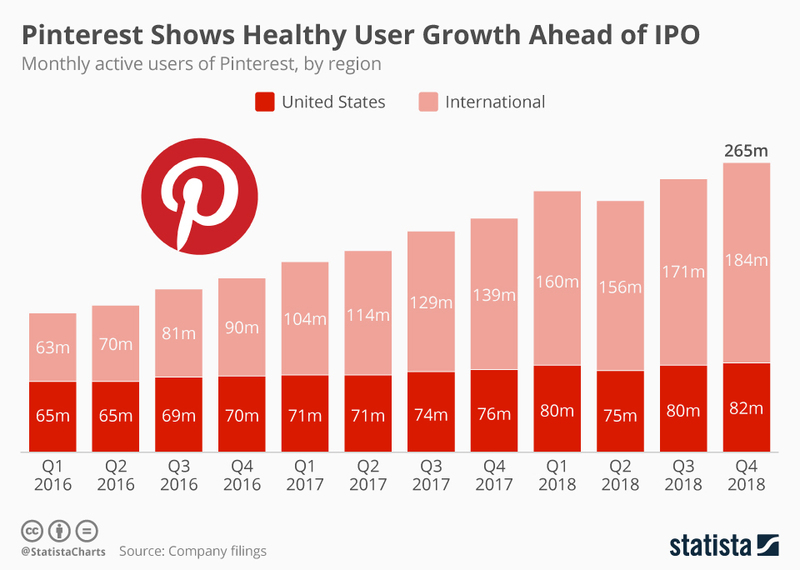 More importantly, Pinterest has a lot more to offer already (as compared to Twitter and Snap at Pre IPO) and this is one of the main reasons why the user base is constantly increasing at a rapid pace. In 2018 alone, around 51 million users joined Pinterest and the international market seems to be already in love with the idea of using a media-rich tool for discovering things around the internet. Pinterest currently boasts 265 million MAUs. "As of March 31, 2019, we expect to report global MAUs of 291 million, representing an increase of 22% compared to March 31, 2018. The increase in global MAUs was primarily due to our continued focus on localizing content in international markets. ", claimed Pinterest in a report.